I hope you're all well and haven't been defeated by the stress of exams yet. Hold in there - I can see a light at the end of the tunnel! My own exams finish on June 12th so I cannot wait to have them out of the way and to be able to pour more of myself into blogging. It's so hard to juggle exam work and blogging - I can't wait to finally not feel guilty when writing about my latest lipstick or sitting and reading other peoples blogs for hours! Anyway, as most of my days have been spent in joggers (and onesies - I won't lie), I thought it was about time for an OOTD post. Recently I've been getting up and diving into revision so have had lots of makeup-free and I'm-going-to-wear-my-pyjamas-all-day days, which is good as my skin is glowing from my makeup-break, but bad as after a while sitting in your pyjamas gets a little boring. Putting on some red lipstick or slipping into a pair of heels is enough to cheer anyone up, so I took advantage of my revision-free day today and got a little dolled up to go out. I purchased this gorgeous shirt during my recent trip to Manchester from a small Primark in Selfridges. I fell in love with the tiny Primark and actually ended up purchasing lots of things but this shirt was one of my favourites. I love the floral embroidered detailing and think it's the perfect dainty touch to a classic sheer shirt. I teamed it with a white Forever 21 vest top as it's very see-through and I don't think the world is quite ready for my bras yet! I decided to wear my dark skinnies to make the look more casual and finished my outfit with my gorgeous Primark heels - another purchase from Manchester's Primark. The heels are super comfy and really easy to walk in, which is always a bonus! I opted for red lipstick and kept my hair casual (as always). I think this look is good for a smart-casual meal or for drinks out with friends. It's pretty and a little glamorous but not too dressed up! Hi Amy, are you going to study fashion journalism, or are you not sure what your going specialise in yet? Hi! I'm going on to do an English and Journalism degree. I'm really excited! Gorgeous outfit! Love the pretty detail on the shirt! Thank you - the shirt is one of my favourite wardrobe pieces at the mo! Thank you! I looove the detailing of the top too!! Those are lovely photos of you, Amy, you look really pretty. Best of luck with your exams. Looking forward to more blog posts when they are out of the way! The blouse is so pretty I love the lace panel. 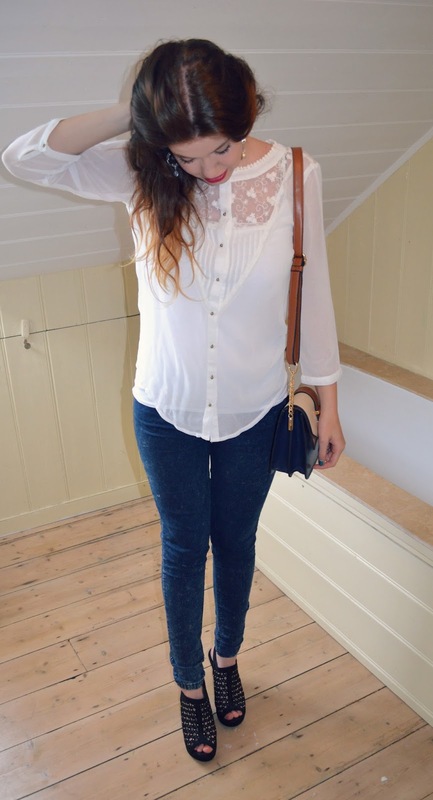 I love the lacey shirt! Looks so good on you! That shirt is pretty, Love the lace detail.